For weeks, we've been reporting on the mess seen in the statewide "recount" of Wisconsin's very close and very contentious April 5th Supreme Court election between Republican incumbent Justice David Prosser and his challenger, Asst. Attorney General JoAnne Kloppenburg. As The BRAD BLOG obtained evidence of new irregularities this week -- to add to previously reported revelations of, among other irregularities, ballot bags discovered "wide open" with mismatched or missing serial numbers as well as ballots discovered completely unsecured, all in violation of the secure chain of custody, and other similar messes and mistallies across the state -- we wanted to find out if the state's chief election agency, the Government Accountability Board (G.A.B. ), was able to confirm that the ballots counted during the "recount" were actually the ones cast on Election Day. And, if so, how they could confirm that. To date, with about 25,000 "recounted" votes still to be canvassed from the now infamous Waukesha County, some 2,690 votes have been discovered during the "recount" to have been originally mis-tallied. That's according to the G.A.B. 's own figures, and includes hundreds of thousands of ballots which were simply re-tallied rather than counted by hand during the "recount," on the same computers which tallied them -- either correctly or incorrectly -- on Election Night. 31 of the state's 72 counties counted some or most of their ballots by hand for the first time during the "recount" (including several of the largest counties). But, given the fact that supposedly "secured" ballot bags were discovered during the "recount" to have been "wide open" and not secured at all, with little or no explanation from officials, after being accessible for weeks by the same untrustworthy and partisan election officials, such as Waukesha's County's activist GOP County Clerk Kathy Nickolaus, who screwed up the tabulation in the first place, how is it that anybody knows if the ballots finally counted by human beings are actually genuine? The G.A.B. generally agrees with the campaign of the election's current leader, incumbent Justice David Prosser, that broken security seals, opened ballot bags -- even some that are torn open and taped back shut with duct tape, as seen in Waukesha County this week (photos below) -- and other violations of chain of custody are of little concern. So long as the newly tabulated results largely match the results printed on the poll tapes by the computer tabulators at the end of Election Night on April 5th, that is, essentially, close enough for government work. The G.A.B. and the Prosser campaign, as we confirmed with each directly, and as the G.A.B. indicated on a recent post to their website published in the wake of the specific questions we've been asking them -- are placing their faith largely in the accuracy of the state's oft-failed, easily-manipulated, privately-manufactured electronic voting systems made by companies like Diebold, ES&S and Sequoia. They are also placing faith in their election official colleagues around the state. All of which begs the question: What's the point of having a "recount," or of using security procedures and physical seals for the ballots after the election, if violations of those procedures and seals are of little concern to the state's top election agency? 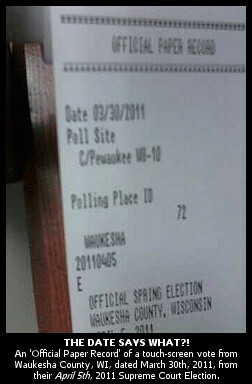 Worse, if the results printed on the poll tapes are the ultimate proof of the accuracy of results, what happens when -- as discovered among poll tapes from the City of Pewaukee in Waukesha County late last week -- the "recount" uncovers "Official Results Report" poll tapes dated a full seven days before the actual election was held? "Even if the container or [ballot] bag is somehow opened later, or if the chain of custody is broken," the G.A.B. wrote on their website in response to the concerns late last week, "election officials have the original print-out tape from the machine, as well as the electronic memory device from the machine. This enables election officials to determine the election night vote count." Setting aside that the "recount" process in WI does not include examination of "the electronic memory device from the machine[s]" at all, the print-out tapes from the systems may enable election officials to know what the tabulation machines reported -- either accurately or inaccurately -- as the "election night vote count," but do those digital elements actually tell us what the intent of voters was? If they do, then why bother to have a "recount" at all? "If the ballots had been tampered with between the election and the recount, there would be a break in the chain of custody and an unexplained difference in the results [of the 'recount']," says the G.A.B., suggesting that they seem to have little or no idea how election fraud may be carried out under their very own noses. As reported here in great detail here over the past month, there were definitely violations and breaks in the chain of custody of thousands of ballots. If they had been gamed, in order to avoid getting caught in this very close, very high stakes election -- for a 10-year term on the state Supreme Court during one of the most tumultuous periods in state history -- it's as simple as swapping in ballots to match the totals on the gamed poll tapes. (Gaming those tapes can be as simple as seen in this clip from HBO's Emmy-nominated documentary Hacking Democracy.) If one happened to have blank ballots and knew those blank ballots would not be reconciled, even during the "recount" (since they do not do so in WI), and one had possession of the ballots for a full three weeks prior to the "recount" -- like, say, Kathy Nickolaus or any other election insider in the state of Wisconsin -- it would be worth both the effort and the risk to avoid detection if one had gamed the front end, as discovery of the dirty deed during the "recount" would otherwise result in some very hard time. But so long as the poll tapes generally match the "recounted" ballots, according to both the G.A.B. and the Prosser camp, there's no problem.